The Ant & Mike Show - "We Do More Than Gossip": Can We Pleeeease Hurry This Up?!?!? Can We Pleeeease Hurry This Up?!?!? I hate to be a cynic about the whole situation, but I am tired, tired, tired of these Democrats. They have taken what was supposed to be a positive election and turned it into countless months of arguing, bickering, fighting, suspicious campaigning, and questionable fund raising. Meanwhile, this is all just to get a Democratic nomination. Nobody’s thinking about John McCain, and the lack of focus on the real competition will only be a hindrance on the Democratic nominees’ actual presidential campaign. As of Sunday, Barack Obama has virtually tied Hilary Clinton in the superdelegate vote (he has 273, she has 273.5). Sen. Clinton has repeatedly said that despite the onslaught of superdelegate endorsements that Sen. Obama has received recently, she has no plans on dropping out of the race until one of them has enough delegate votes to win the nomination. This means that the blowout she just got in North Carolina didn’t scare her away. In fact, headed into their next primary in West Virginia, polls show Clinton has a substantial lead (43%), which means the seesaw battle between the two is nowhere near over. I just want a winner to surface and surface fast, because neither of them has saved the world yet, and honestly may not have the opportunity to. The Republican presidential nominee is somewhere making preparations for what is sure to be a strong campaign. He’s had months to sit back and watch Clinton and Obama debate, and while he’s becoming familiar with the opposition, the two of them are still stuck on each other. Whenever one takes the lead, the other one fights back, and they are both using every dollar of funding that they can get for their campaign against one another. At first I was excited to see these two take command over the democratic nomination, and draw such positive attention to the election process. However, I think what was once a good thing, has now become a nuisance on the actual goal; the presidency. While the two of them are fighting to beat each other to the front steps of the White House, McCain is standing in the Oval Office making himself familiar with the décor. 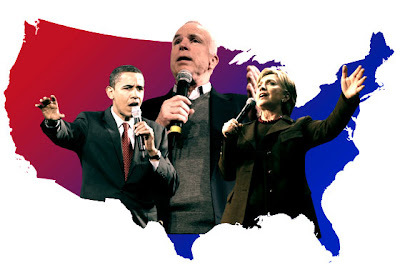 I hope that both Democratic nominees save some preparation and some funding for the fight they’ll have against Sen. McCain, because in all honesty, if Clinton and Obama are throwing their best punches at each other, they may not have enough to compete in the main event. I think the whole world agrees with you Ant, whether you're for Hilary or Barack or maybe even Republican....you have to be sick of the bullsh*t!....This is dividing the party and most people that I have spoken with who are supporters of Barack say they won't vote in the presidential election if Hilary wins!